Throughout the 90s Rugby Cracker added new services for young people to get involved in. 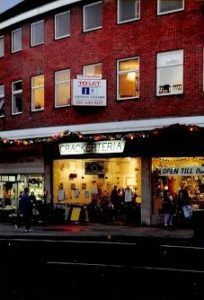 The Crackerteria café was introduced in 1992 whilst the ‘A la Carté’ evening restaurant debuted in 1993. ‘A la Carté’ was unique as whilst temporary radio stations and cafés were staples of Christmas Cracker projects across the country; ‘A la Carté’ was an original idea created by Rugby Cracker. Then between 1994-1996 ‘The Cracker’ newspaper was introduced as a publication written for young people by young people. 1994-1996 were also notable years for Radio Cracker. 1994 saw no radio for the first time in 3 years and in an attempt to get it running again in 1995, Radio Cracker was broadcast from Katie’s Bedroom! It did move out into the town centre 1996 but only into a space slightly bigger than a cupboard. The national Christmas Cracker initiative was replaced in 1997 by the Oasis Trust’s ‘The Big Take’ project. Rugby Cracker continued as before but Radio Cracker rebranded to Cracker FM. Between 1997-1998, ‘The Big Take’ project launched a short film competition where local projects had to create a video based on that year’s theme. Highlighting the struggles of street children in the third world, Rugby Cracker created the film ‘Justice – Not Just Us’. This was followed up in 1998 with ‘Mission Impossible’, a video dedicated to displaying the lack of education in the developing world. Both films won in their respective years and gave the team the opportunity to meet then British Prime Minister Tony Blair and his wife Cheri in London. 1999 was a bit of a struggle, there was no permanent Crackerteria and Cracker FM was broadcasting out of long time volunteer Mike Autherson’s dining room! Despite this Cracker had been a massive success as between 1992 and 1999, Rugby Christmas Cracker had raised over £65,000 and we weren’t finished yet!